Before he took photos of David Bowie, Marlon Brando and Barbra Streisand, a noted photographer aimed his camera at Dr. Martin Luther King, Rosa Parks and James Baldwin. A pair of new exhibitions offer a side of celebrity but focus on one man’s view of the struggle for civil rights. Steve Schapiro worked for Time and Life magazines during the golden age of photojournalism. We met him for the inside story of how he witnessed history and documented it. Phil Ponce: At Roosevelt University’s Gage Gallery, an uncommon photography exhibition looks at contact sheets – all of the images printed from a single roll of film. They show the famous photos that ended up in books and magazines, plus the overlooked shots – every picture the photographer captured. Mike Ensdorf, professor of photography at Roosevelt University: It’s not often that you get to see a photographer’s process. They’re almost like little sketchbooks. Each contact sheet has so many variations on a photograph at times, and you can see the photographer working through their process, working through the event or the stages of the event chronologically. Steve Schapiro: As a photographer, you covered what was happening during the day and hoped that you got some really good pictures, and then your film went off to Life magazine lab. They processed the film the next day, and you probably never saw your contact sheets for a year, you know, for a long time because you kept moving. Basically your interest at the time was whether my pictures would make the magazine next week. You had no sense that 50 years later we would have exhibitions with it. He also took classic photos of Barbra Streisand and Jacqueline Kennedy. 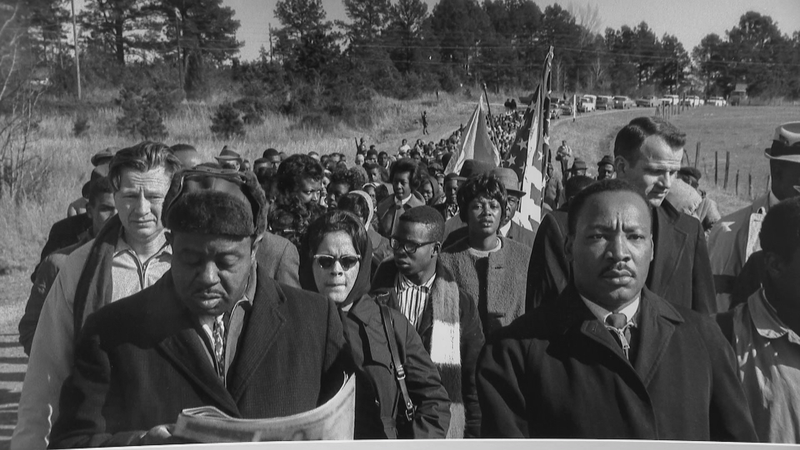 From 1963 to 1968, Schapiro made indelible images of the civil rights era. Schapiro: I’d heard about things happenings in the South but it never really came to life, you never really experienced it. And, it was a faraway situation. So traveling that way you really saw what was happening there. Ponce: He followed the author James Baldwin through the Jim Crow South. He attended segregationist rallies in Florida. And he extensively covered Martin Luther King at rallies and marches throughout the American South. Schapiro: Martin Luther King was an amazing, spiritual, non-violent leader. The way he talked really emotionally captivated and energized so many people. When I finally looked at my contact sheet book, which was all the pictures I had taken of King and other leaders and of the civil rights movement, I noticed that there was something in Dr. King’s eyes where he would sort of look through the crowd, and you sensed that because of all these death threats he had a forbearance or a sense that something might be happening at any moment. Ponce: When King was assassinated, Schapiro photographed the killer’s perch in the nearby rooming house in Memphis. Schapiro: I then went to the Lorraine Motel and Hosea Williams, who had been one of King’s aides let me in and I saw on a level shelf King’s attaché case, which was open … and then suddenly the image of King came on the television set, which was behind the commentator, and I photographed it all as one photo. And to me it was an important picture because it showed you that the physical man was gone forever, that his material things remained, and yet his spirit hovered over us and still was with us, in that sense. And I feel that that’s one of the best pictures I’ve taken. Ponce: At the Illinois Holocaust Museum in Skokie, a companion exhibition looks at some of Schapiro’s most famous photos of both activists, and icons. Susan Abrams, CEO, Illinois Holocaust Museum: Steve Schapiro’s work and our exhibition “Activists and Icons” enables us to build on our message here at the museum that we can all be activists by showing us not only the famous folks from the civil rights movement like MLK and John Lewis and Rosa Parks, but the grassroots workers, the students, who made it all happen. Schapiro: It was really a question of capturing the spirit of people involved, the spirit of the movement, of just trying to show what everything was about. Abrams: Steve specifically selected this image to be the first image in the exhibition because here you see up-close this student, this young person, anonymous, doing the hard work to create the change behind the scenes. Ponce: Also on view are Schapiro’s portraits of celebrities who challenged cultural norms. We asked him about one of them, a young Muhammad Ali. Schapiro: He played Monopoly with me and as we were playing I was losing and at one point it looked like all my property was going to go back to the bank and Muhammad, who was then Cassius Clay, kept loaning me money so that eventually he would win everything on the board and he would own absolutely everything. Ponce: We also asked the photographer about the dangers he encountered as a journalist working in the American South in the 1960s. Schapiro: I was very lucky and I only had one real encounter. We were in the car and I saw this heavyset sheriff standing, oh, at a distance from me. And I started photographing him, and he came towards me, he took the camera out of my hand, and he opened the back of the camera, took the film out, threw it on the ground and gave me back my camera. And I never realized how lucky I was – he was Sheriff Rainey, who was one of the organizers in terms of the killing of the three civil rights workers (in Philadelphia, Mississippi). Ensdorf: The work that emerges from the both Holocaust Museum show and our show here at Roosevelt really is a testament to his attention to detail and, and to seeing, seeing things, and exploring and, you know, capturing. All things that a good photojournalist does just you know inherently. It’s in their blood, it’s in their bones. Schapiro: There’s no real difference in terms of photographing in a documentary way, or working on a movie set in the sense that you’re looking for the same things. You’re looking for the spirit of a person or the spirit of an event, and that’s what you’re trying to capture. Steve Schapiro is still taking photos. Although he is now based in Chicago, he is creating a book of photographs of his native New York. The exhibitions of his work are currently at the Illinois Holocaust Museum in Skokie and the Gage Gallery of Roosevelt University.